The two men who could determine whether Los Angeles teachers go on strike sound almost as if they inhabit different worlds. They don’t even agree on a set of basic facts, which makes negotiation difficult. L.A. schools Supt. Austin Beutner speaks of a school system teetering on insolvency and failing so many students that aggressive changes are needed, including new ways to assess teachers and quickly push out ineffective ones. Alex Caputo-Pearl, who leads the teachers union, says teachers at traditional public schools try valiantly but are besieged — even sabotaged — by outsiders who want to dismantle the district and by officials like Beutner who would rather stockpile money than use it to help teachers and make schools successful. In the gulf between these competing realities, a teachers strike seems increasingly likely. The tension between the two sides has been building at a fraught moment for the nation’s second-largest school system. Enrollment, which is the basis for funding, continues to decline because of population trends and the growing number of privately operated charter schools. And, as officials struggle to offset the problems that come with more than 80% of students living in poverty, student achievement remains well below state averages. Both leaders believe they are at a crucial turning point that could lead either to disaster or meaningful reform. If salary were the only issue, the divide would seem bridgeable. United Teachers Los Angeles wants a 6.5% raise retroactive to July 1, 2016. The district is offering a 3% raise that would begin a year later, followed by an additional 3% bonus that would become permanent if budget projections remain in the black. The contract was the subject of protracted negotiations long before Beutner became superintendent in May. But the previous superintendent and the interim leader who followed started their careers as district teachers and so had natural common ground with the union. Beutner’s background is in business and philanthropy, not education. He’s been a donor to local charter schools and has touted their successes. These are the same charters that Caputo-Pearl denounces for being “unregulated” and for siphoning away students and thus $600 million in resources that would have gone to district schools — and union jobs. Beutner says the status quo is no longer acceptable — and by that he means schools with low test scores. Caputo-Pearl, a hard-charging former teacher, used to work at such a school. He recounts his distress at being transferred from his beloved job at Crenshaw High as part of a campuswide shakeup to address low academic achievement. Instead of working with Beutner, Caputo-Pearl has used Beutner as a foil to stir up his rank and file. “Will we accept lies from those who see the Los Angeles Unified School District as a business to be downsized rather than a civic institution to protect? Will we accept those lies?” he said in his keynote address during the union’s summer leadership conference. His attempt to stir passions is understandable during an uncertain period for his union and labor. 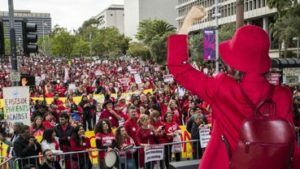 In the last two elections, UTLA has fared poorly, with candidates backed by big-money charter supporters ultimately winning a controlling majority on the Board of Education. And the U.S. Supreme Court this year ruled that union membership is optional— overturning California’s closed shop and threatening the union’s financial stability and influence. And yet, this last school year also saw teachers go on strike in Republican-dominated states such as West Virginia, Arizona, Oklahoma and Kentucky — winning major concessions. This also could be a defining juncture for Caputo-Pearl, who is in the home stretch of his second and final term as president. He’s spent the better part of six years rebuilding local chapters school by school. Now may be his best and only chance to mobilize that strike army. Caputo-Pearl insists that the battle must be waged outside the familiar yard markers of wages and benefits for current employees. He wants a settlement that will launch a massive hiring of teachers, librarians, nurses and counselors — union members all — to reduce class sizes and “fully staff” schools. Such measures, the union emphasizes, would directly help students. Beutner’s counter is pragmatic: The money’s not there. The district is spending much more than it is taking in, and much of the money in the district’s reserve account already is committed. County and state officials have largely agreed with this analysis, which has driven the district’s negotiations. Beutner and Caputo-Pearl both think the district needs more money, and both believe that the state and federal governments should be pushed to provide it. But neither Beutner nor the Board of Education pushed to join the many school districts with local tax measures on November’s ballot. They said the timing was not promising to persuade voters. Caputo-Pearl has criticized that thinking. He’s also focused on the surplus remaining in district coffers at the end of the last fiscal year in June — which was $1.86 billion, an apparent record. He sees money enough to use now and enough time later to find more. Caputo-Pearl’s vision of disaster — and what must be done to avert it — has more to do with beliefs than budgets. He’s putting a stake in the ground about issues that have distressed teachers for years, at a time when the union still has enough clout to change the course of history. For that reason, the union leader has seized this moment to demand greater union and district control over charter schools, most of which are nonunion. Nearly 1 in 5 students attending local public schools are now in charters. The result is fewer L.A. Unified teachers — and fewer union members. Teachers union membership in L.A. Unified has dropped from 42,000 to 31,000 since 2007, according to the school system. The union also has chosen this time to take a stand against what it calls “overtesting,” the frequent use of standardized tests, which can narrow the focus of instruction and also be used to evaluate teachers. Beutner also has an agenda beyond finances. For example, he wants to expand the rating scale by which principals can evaluate teachers. The goal, he says, is to recognize and reward great teaching — and to push out teachers who aren’t delivering. Many union members fear the beginnings of a system that would lay off or fire teachers based on student test scores or the arbitrary preferences of administrators. Beutner is resisting union efforts to give teachers more control over such matters as testing as well as how campuses would be shared with charter schools. He also has yet to reveal a long-term strategic plan, and teachers have filled the vacuum with their worst suspicions. Last week, the two sides moved from mediation, which failed, into “fact-finding” — which is supposed to provide an independent analysis of district finances. After that, the district could impose a contract and the teachers could go on strike, perhaps as soon as November. To avoid a strike — or to settle one — both sides are going to have shift their thinking, Rogers of UCLA said.